Transformer utilization factor, in case of a bridge rectifier, is higher than that of a centre-tap rectifier. It can be used in application allowing floating output terminals, i.e. no output terminal is grounded. The need for centre-tapped transformer is eliminated. The transformer is less costly as it is required to provide only half the voltage of an equivalent centre-tapped transformer used in a full wave rectifier. If stepping up or stepping down of AC voltage is not needed, and then it does not even require any transformer. The PIV is one half that of centre-tap rectifier. 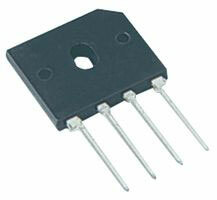 Hence bridge rectifier is highly suited for high voltage applications. Two diodes in series conduct at a time on alternate half cycles. This creates a problem when low DC voltages are required. This leads to poor voltage regulation. It requires four semiconducting diodes.